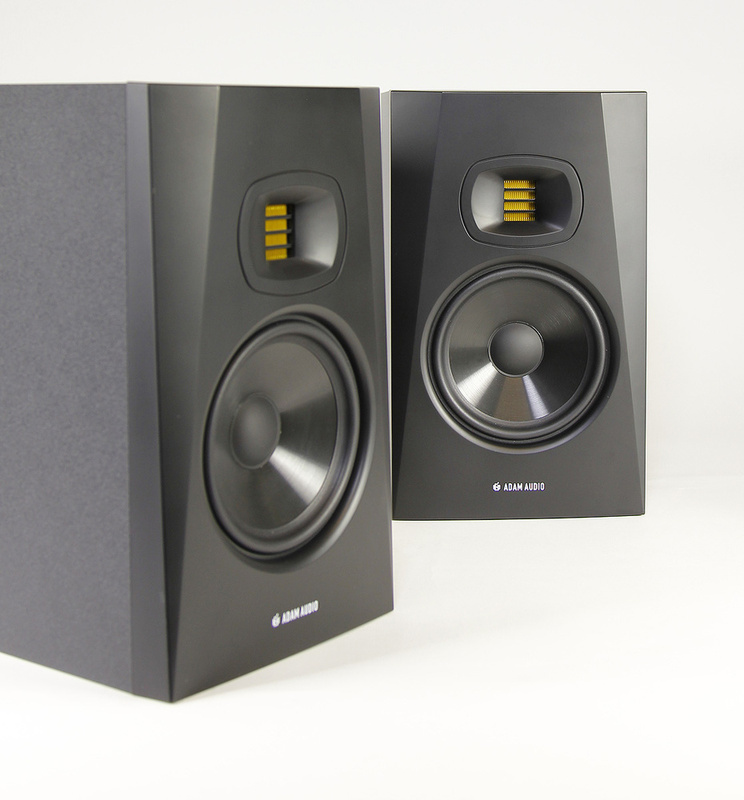 There are plenty of cheap and cheerful monitors around for those with basic bedroom studios, and there’s also no shortage of more professional monitors from around £$750 a pair upwards, but the sub £$500‑per‑pair middle ground yields leaner pickings. 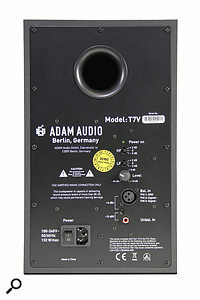 That’s where ADAM Audio’s T7V comes in. Yes, these speakers are built in China to meet their attractive price, but the standard of engineering gives no cause for concern. 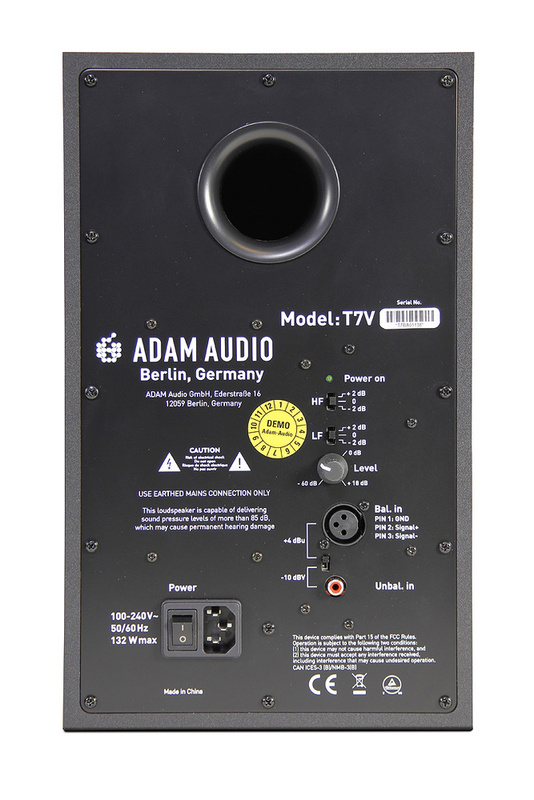 In concept the T7V is similar to the more costly ADAM speakers, using a 1.9‑inch Accelerated Ribbon Tweeter (sometimes called a ‘folded ribbon’ tweeter). Its seven‑inch woofer delivers a bass extension down to 39Hz while the waveguide‑loaded tweeter handles the highs up to an impressive 25kHz. The waveguide controls the HF dispersion with the aim of keeping the directivity as consistent as possible at the crossover point, providing a sensibly wide sweet spot. For smaller rooms, the five‑inch T5V is a viable alternative, and while the T Series speakers are designed to provide full‑range coverage, they can also be used in conjunction with ADAM’s Sub8 subwoofer to create a 2.1 system. The 15mm MDF cabinet features a moulded plastic baffle with the characteristic angled ‘stealth’ shape seen on other ADAM monitors. It is rear ported, and port exit is flared in order to reduce port noise due to turbulence. Polyester ‘wool’ is used as an internal cabinet damping material. All the connections are on a steel rear panel, behind which is a Class‑D power pack delivering 20 Watts for the tweeter and 50 Watts for the woofer, crossed over at 2.6kHz. This is all handled by a Texas Instruments TAS5754M combined amp and DSP chip. Inputs include the expected IEC power connector (with switch), plus a choice of balanced XLR and unbalanced RCA phono inputs, with a input selector slide‑switch and a non‑detented rotary sensitivity control. Switchable LF and HF shelving filters allow the lows and highs to be adjusted separately to be either neutral, boosted by 2dB, or cut by 2dB. The T7V has both balanced and unbalanced inputs, as well as controls for adjusting the overall level and the high‑ and low‑frequency response.With a specified SPL rating of up to 110dB per pair at one metre, the available level is more than adequate for the intended nearfield deployment — though there’s no clip LED to warn you if you push things too hard. Furthermore, the power LED is on the rear panel; there’s no power indication visible from the front. While it is not unreasonable to subject professional monitors to a battery of electronic and audio tests, the real question with more affordable monitors such as these is whether or not they enable you to deliver mixes that translate well to real‑world listening situations. All loudspeaker systems show wrinkles in their frequency and phase response curves, and all ported speakers suffer from some degree of bass overhang — but if the design has been handled with care, these inevitable imperfections shouldn’t be serious enough to compromise your work. And in reality, the effects of imperfect room acoustics and the use of unsuitable speaker platforms (or wobbly stands) often masks the more subtle attributes of the speakers. As with any ‘cost‑effective’ speakers, it is wise to check your mixes on headphones, not least because that way you also exclude room problems. Headphones can also show up sonic problems that you might miss on even the best speakers. The fact that so much music is now listened to on headphones also means that you need to double check that everything sounds correct on ‘phones. That said, the T7Vs do an excellent job given their cost providing you don’t place them too close to a wall as the rear porting needs to be unobstructed. Ideally you should leave at least 200mm between the rear of the speaker and the wall. In a typical small studio environment, the T7Vs manage a well‑balanced overall sound with detailed but non‑aggressive highs and confident lows that — while exhibiting a little overhang — don’t sound excessively ‘plummy’. Their stereo imaging is also well defined with a stable centre image. In many respects the sound follows the general character of the popular ADAM A7Xs, but with perhaps a little less overall brightness and tightness when the EQ is set flat. There may also be a hint less finesse in the mid‑range, but really there’s surprisingly little in it given the price difference. I found the T7Vs very comfortable to work with and I’d be happy to use them on serious projects. They remain clean‑sounding up to comfortable mixing levels, and while 110dB should be considered a peak rather than a target level, there’s plenty of clean power in hand when you consider that you’ll probably be sitting only a couple of feet from these speakers. 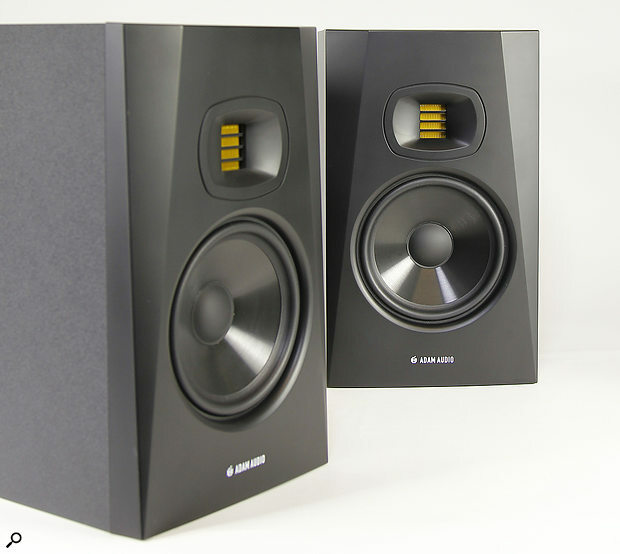 Overall then, ADAM have done a great job in producing a trustworthy monitor at a very attractive price, and while more money will buy you more accuracy, the law of diminishing returns means you may have to spend quite a lot more to hear any significant improvement. Probably the most comparable alternatives in this price range are from PreSonus, KRK, M‑Audio, Mackie, Yamaha, Swissonic and Alesis, though also consider the Focal Alphas. No power or clip LEDs visible from the front. All affordable speakers are a compromise, but here the compromises have been managed very carefully to deliver a speaker that compares well with many of the more costly alternatives. £358 per pair including VAT.